Develop WebRTC based soft client to make audio and video calls from/to soft and hard turret. No separate plug in should be required. Session Establishment and communications on SIP Over Web socket transport protocol. We opted for the browser based WebRTC API’s as a web communication technology to provide trading enterprise to take advantage for their business. WebRTC does not use any additional plug ins for making calls from browser to browser neither does it required any installation . Hence requirement fulfilled . BT required a POC solution which is free from any proprietary client or API technology. Used Freeware light SIP Server which acts like translator Engine to convert the SIP over WS message to SIP over UDP. This enables initiating the call from the web Browser and terminating the call at the Hard-phone. Soft Phone/ SIP Client : Boghe IMS client was used to act like Soft phone which supports the Audio Codec required to talk with web Client like PCMU And PCMA audio Codec. We proposed solution for the requirement of development of communication client having all the soft phone features including audio/video calling, messaging and integration with AT&T services Visual voice mail and IP messaging. Agile method for implementation with presence at onshore, offshore and near-shore locations. The ubiquity of the existing platform would act as solution accelerator and ensure superior product quality, faster time to market, low risk and optimized cost for service providers globally. Cloud ready and ensures maximum reusability across platforms. 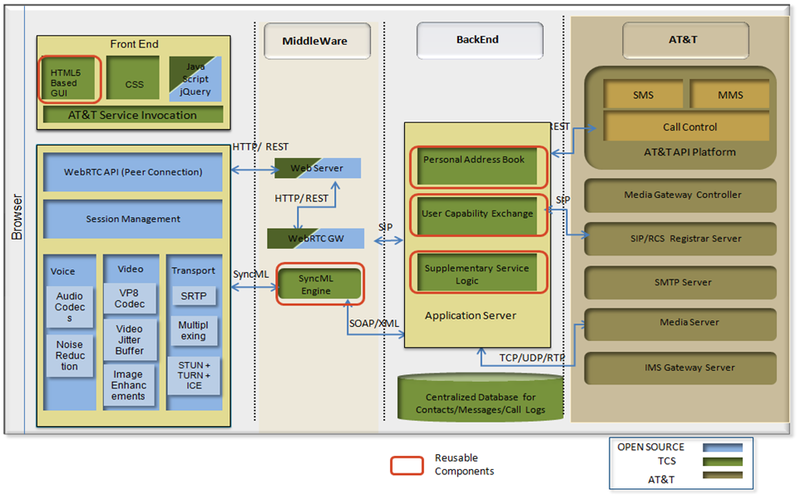 Compliance to industry standards -IMS, SIP, WebRTC (GSMA), W3C, IETF. Solution includes features for Voice/Video 6 party conference, Major audio/video codecs, Instant messaging, File sharing, Geolocation, Integration with PSTN and IMS, social networking sites like – Facebook, Google. Soft Client for iOS Communication Client provides voice chat, network address book, location sharing and viewing the map between the two locations. GSMA based REST APIs provides a light weight client which can be integrated with minimal effort into existing framework.